Established in 1962, the French School of Kuala Lumpur (LFKL) is a not for profit and parents governed school, welcoming 730 students from 47 different countries, from kindergarten to high school. LFKL students follow a French curriculum leading to the French Baccalaureate that includes a European section, they benefit from a high standard education that includes cultural, artistic, technical, scientific, literary and sports activities. Courses are provided by qualified French teachers attached to the Ministry of National Education and by professional English native-speaking teachers. 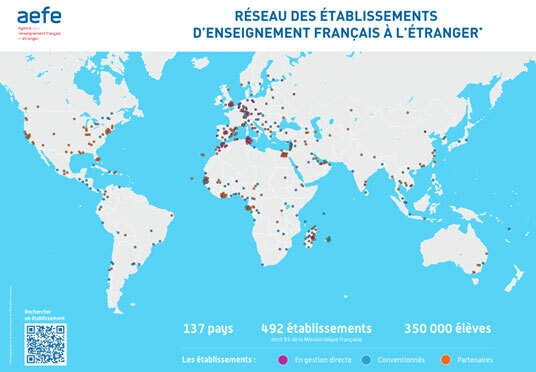 The LFKL is also part of the AEFE (Agency for French Education Abroad), a global network of 496 French schools in 137 countries that gathers 355 000 pupils. French schools abroad share a unique curriculum, allowing students to pursue their studies anywhere around the world. Open to plurilingualism, the LFKL takes into account the diversity of its students and offers a curriculum adapted throughout their schooling. The school offers an early English program for kindergarten students through educational activities, by group level, taking into account the diversity of their language levels. They pass language exams every year and receive international language certifications (Cambridge Exam, DELF, DELE, IELTS). The LFKL enables students to access the best international universities and top higher institutions. The school is known for its outstanding results at the French national examinations (100% success rate at the Baccalaureate, with 80% of Graduation with honours at the 2017 session). Last year, 45% of the graduates left the LFKL to study abroad (in Canada, England, Australia, Switzerland, Spain, the United States, Malaysia, Indonesia and Lebanon) in prestigious institutions and universities. The LFKL first opened for only a few students and was generously hosted by the Alliance Française. The establishment received the regulatory approvals from the Ministry of French National Education. The little French school had on its campus about twenty students from Grade One to Secondary One. The number of students reached 42, the school moved to the expatriate district of Bukit Tunku. LFKL became a non-profit association and signed a convention with the Agency of French Schools Abroad (AEFE). The school also obtained a regulatory approval for secondary classes (1996) and high school classes (1997). By offering an approved curriculum from kindergarten to highschool, it was necessary for the LFKL to move again and start building a bigger establishment. The 1st stone of the new French School was laid in Segambut (at the current establishment). The inauguration of the new infrastructure took place in September 2005 to accommodate 339 students. Today, the LFKL gathers 120 employees, guaranteeing a high standard curriculum in accordance with the French conventions, regulatory approvals and programs. The establishment brings together more than 380 families including 760 students in an international environment. To answer this question and discover the lifepath of the peculiar writer after whom our school is named, we invite you you watch one of the versions of the plurilingual biography we have created. There were several objectives to this project: we wanted to stress and celebrate the diversity of languages taught at LFKL, as part of the first ever Language Week sponsored by the French Ministry of Education this spring. 10 language teachers and around 75 students got involved, in 7 different languages. We also wanted to take part in the naming of the school and pay tribute to the figure who was chosen to represent it. We hope to allow each member of the community (students, staff and parents), regardless of the languages they speak, to learn about the man behind the name and his life story. So here is our video biography of Henri Fauconnier, available in French, Malaysian, Chinese, English, German and Latin, or in a plurilingual edit presented as part of the exhibition at the naming ceremony. Congratulations to all students and teachers for this collaborative achievement! The LFKL, like most French schools abroad, is a privately-run school, managed by different decision-making and consultative bodies. As LFKL Bhd. is a Malaysian registered company, it is managed by a Board, whose statutes can be viewed below, as well as its Code of Ethics. Statutes of the LFKL in English (complete version including memorandum, articles and annexes.) and in Bahasa. The agreement between the LFKL and AEFE is available here.